This is an in-depth review of the JumpKing Oval Trampoline. You’re going to find full specs of this model plus some other details you may find useful. Moreover, we’ve uncovered some pros and cons for this trampoline. In addition, there is a video to help you through the assembly as well. The JumpKing Oval Trampoline is available in two standard sizes, with the 8-foot model being the most popular. It has been made with safety as a priority. 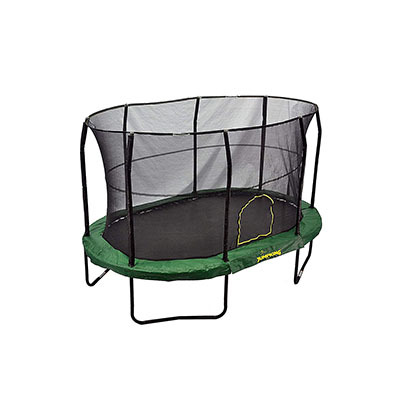 As a result, all metal attachments and springs are padded, and the trampoline is fully-enclosed with a net. The net itself has added security, so kids cannot accidentally fall through the opening. All the hardware and supports are galvanized steel for sturdiness and durability. When compared to alternative trampoline choices, the JumpKing Oval Trampoline falls in the affordable to medium price category. It is bordered with an appealing green and turquoise blue rail pad, with blue strips adding strength to the protective net. Customers can purchase an expert assembly package when you buy your trampoline. On the other hand, there is a featured video below that explains how easy it really is to assemble the JumpKing Oval Trampoline. There are a total of 56, five and half inch galvanized springs perfectly spaced around the trampoline. Jumpers will feel secure, but also know they are able to attain the heights that take their breath away in excitement. With enhanced safety features, parents can feel secure allowing even toddler age children to experience the fun of jumping on a trampoline. While there are larger JumpKing Oval Trampolines, owners found the size of this model to fit well in smaller spaces yet still retaining plenty of jumping room. Ages: Ages 3 (supervised) and up. Price range: Affordable to medium. What owners found most appealing about the JumpKing Oval Trampoline was the sturdiness of the safety features. The jump space is fully enclosed with a double zipper system and an extra buckle to secure the entrance. JumpKing has patented their over-and-under spring design to give the trampoline an improved bounce. Jumpers can reach thrilling heights, but at the same time feel safe and secure inside the protective net. This full enclosure not only offers a strong safety feature, but it also gives younger children an added sense of security the first few times they jump. Each spring is padded separately to provide even more protection. The legs are in a W-shape to prevent a wobbly, unstable feel during heavy jumping, or when there are multiple jumpers on the trampoline at one time. On top of that, springs are all covered with a UV protected pad to give parents even more peace of mind, though the net also shields the jumper from the springs. While there should always be spotters and adult supervision for younger children, the JumpKing has taken steps to enhance safety. All the safety standards for this trampoline meet or exceed the established requirements of the ASTM safety council. The frame is made with heavy-duty steel tubing, with a rust-resistant protective coating. It’s both sturdy and durable. To add another measure of protection against the outdoor elements, every JumpKing Oval Trampoline has a full cover. One of the biggest advantages owners mention of the JumpKing Oval Trampoline is how easy it is to assemble. The video link below will guide you through each of the simple steps. Another nice feature of this trampoline is the size. It is small enough to fit conveniently in a confined space, but still big enough for multiple jumpers to use safely. When compared to the price of bigger or more elaborate trampolines, the JumpKing Oval Trampoline is very affordable. It is great for loving parents who want to get their children a trampoline but need to remain budget conscious. While the support poles are underneath the main trampoline, JumpKing still padded these parts as well to provide safety for outside spotters. All the hardware, supports, and connections are made using galvanized steel. This helps your JumpKing Oval Trampoline last for years even if you leave it up outside for months at a time. Since this is a large item, the trampoline will ship in more than one box. The only real problem is when parts of the shipment arrive on different days. While the frame and mat carry a full, one-year warranty, the enclosure net and accessories only have a 90-day warranty period. Here is a link to an informative video that shows you how simple it is to assemble the JumpKing Oval Trampoline. It walks you through a detailed layout of all the parts and pieces, and how to follow the step-by-step process to have your trampoline up and ready in just little over an hour. The JumpKing Oval Trampoline is a safe and fun way for kids to burn off energy. They can learn safety concepts, plus get some exercise. Jumping on a trampoline is also excellent for improving body control. Let us know what you think about this trampoline model by JumpKing.